MAPP researchers introduced school children to advanced powder processes at the Get Up To Speed with STEM event. The annual event is held at Magna Science Adventure Centre, Rotherham, South Yorkshire, and is designed for young people to see some of the UK's most exciting science, technology and engineering inventions, and meet the people who design, build and operate them. 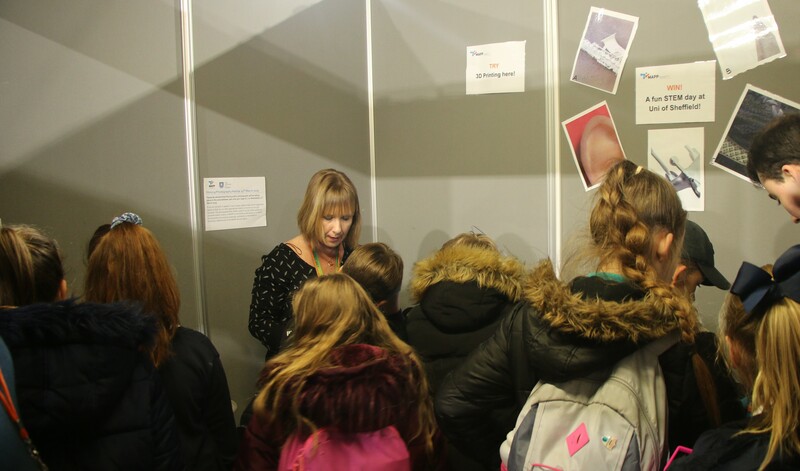 The MAPP stand gave attendees the opportunity to find out more about advanced powder processes, with hands on activities, a quiz and an opportunity to win their school a special visit to the University of Sheffield. Scores of pupils watched a 3D printer in action, spoke to PhD students and research associates about their work, how a 3D printer works and material properties, and tried out some 3D printing pens. Thomas Robb, MAPP aligned PhD student, Dr Felicity Freeman, MAPP aligned research associate, George Maddison, MAPP aligned PhD student.